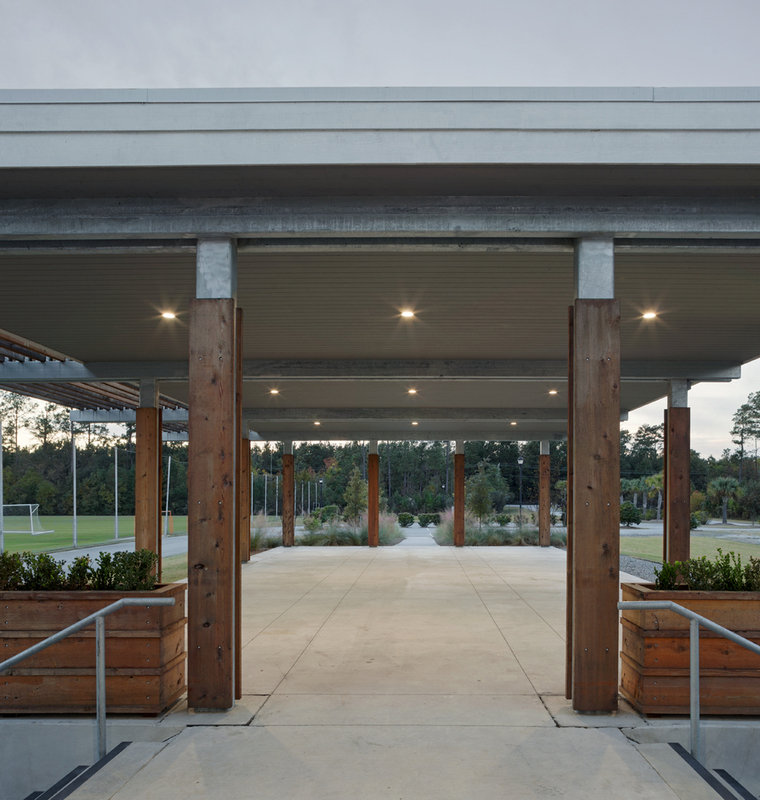 The design for the SCAD Athletic Pavilion took on basic program requirements and site design challenges as an opportunity to create an architectural gathering space and entry pavilion for the SCAD athletic fields located in Jasper, South Carolina. The modest program goals included a structure which would contain bathroom facilities, vending, and a covered viewing area but faced the challenge of creating a seamless accessible structure which had to be raised 36” above the existing grade to address the flood elevation. Subtle land sculpting created a gently sloped walkway from the parking area which could serve as an accessible ramp, while a cross axis of stairs allows direct access to the facilities adjacent to the bleacher seating. The grassy berm alongside of the pavilion under the trellis can double as informal seating. The elevated covered area frames beneficial views to the fields beyond. The architectural aesthetic for the pavilion takes inspiration from the adjacent Equestrian facility along with timeless architectural forms and the exposed structure from its utilitarian needs and modest budget. The steel structure which was necessitated by the large cantilevered spans was tempered by the materiality of the wood ceiling, louvers, and stained wood cladding on the exposed steel columns. Oversized board and batten siding and wood louvered panels provides stylistic continuity for the enclosed portion of the pavilion with the nearby stable buildings. The Pavilion received a 2015 AIA Award for Design Merit. The design for the SCAD Athletic Pavilion took on basic program requirements and site design challenges as an opportunity to create an architectural gathering space and entry pavilion for the SCAD athletic fields located in Jasper, South Carolina. The modest program goals included a structure which would contain bathroom facilities, vending, and a covered viewing area but faced the challenge of creating a seamless accessible structure which had to be raised 36” above the existing grade to address the flood elevation. Subtle land sculpting created a gently sloped walkway from the parking area which could serve as an accessible ramp, while a cross axis of stairs allows direct access to the facilities adjacent to the bleacher seating. The grassy berm alongside of the pavilion under the trellis can double as informal seating. The elevated covered area frames beneficial views to the fields beyond. The architectural aesthetic for the pavilion takes inspiration from the adjacent Equestrian facility along with timeless architectural forms and the exposed structure from its utilitarian needs and modest budget. The steel structure which was necessitated by the large cantilevered spans was tempered by the materiality of the wood ceiling, louvers, and stained wood cladding on the exposed steel columns. Oversized board and batten siding and wood louvered panels provide stylistic continuity for the enclosed portion of the pavilion with the nearby stable buildings. The Pavilion received a 2015 AIA Award for Design Merit.